Unique, unspoilt, off the beaten track. These are just some of the terms used to describe this southeastern corner of the South Island. Heading this far south you’ll discover fewer towns and more ‘settlements’ with just a few hundred residents. The gem amongst all of this remoteness has got to be The Catlins. A mix of rural heartland, lush forests and rugged coastline, The Catlins area straddles the border of Otago’s Clutha district and the Southland region. Although a fairly small area, it definitely delivers bang for your buck with many easily accessible natural attractions that you won’t find anywhere else in New Zealand. Here are approximate travel times and distances to and from Balclutha, the main centre in the region. 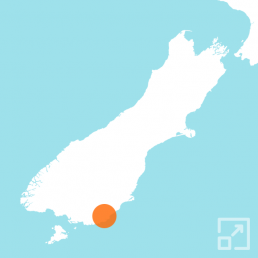 Dunedin is the nearest airport, approximately 1 hour from Balclutha. There is also a limited service between Dunedin and Brisbane Australia, provided by Virgin Australia. Check the Dunedin Airport website for more details. Although not that far from the dry Central Otago region, Clutha and The Catlins has noticeably different weather. For one, there’s more rain throughout most of the year. Also, being this far south, temperatures on the whole are cooler with an average summer (December – February) high of just 18 °C / 64.4 °F and an average low of 10 °C / 50 °F. In winter (June – August) the weather is marginally milder than Central Otago with an average high of 10 °C / 50 °F and an average low of -1 °C / 30.2 °F although it can dip to -5 °C with frosts fairly common. So if we were to sum up the weather in Clutha we would say it’s wet, changeable and when it bears the brunt of storms coming up from the sub-Antarctic, more than a little wild. Don’t say we didn’t warn you. Check current conditions and get the latest Clutha weather forecasts on MetService.com. Looking for ideas to help you plan the ultimate New Zealand outdoor adventure? Here are some of the top things for active travellers to see and do in the Clutha region. No visit to Clutha would be complete without taking the short walk to the viewing platform besides the iconic Nugget Point/Tokata Lighthouse. While there, you should also stop in at the Roaring Bay viewing hide to spot rare yellow-eyed penguin. You can find more details on these and other walks close by on the Department of Conservation website. Set in towering cliffs, these dramatic sea caves 30 metres high are only accessible two hours either side of low tide. Access to the caves is managed and there is a small fee but it’s definitely worth it. You can find more details on the Cathedral Caves website. You just know that any waterfall that appears on a New Zealand postage stamp has got to be worth visiting. This 20 metre, 3 tiered waterfall is easily accessible via a short, well maintained track. It’s just under an hours drive from Nugget Point and then another 40 or so minutes to Cathedral Caves so worth combining all three into a single trip. You can find more details on the Department of Conservation website.